Continuing with the previous Getting Physical blog posts series (CanSec2016's presentation), this time I'm going to talk about what paging implementation has been chosen by Windows and how it works. At the same time and according to Alex Ionescu's blog post, it's interesting to see that Microsoft has started to make some changes on the last Windows 10 Preview versions (Red Stone), specifically talking about paging tables randomization. Starting with the technical writing, the way that Microsoft adopted for paging management is by using the "self-ref entry" technique which I'm going to explain now. It's clear that any of 512 entries of the PML4 could be used for this purpose. On the other hand, we could say that this technique could be used in any paging table level, which makes it NOT necessary to use the HIGHEST LEVEL. The previous script can be used to calculate the paging tables used by any 64-bit valid virtual address. According to the picture, when the CPU accesses to the virtual address 0, it will follow the following path:: - PML4e(0) --> PDPTe(0) --> PDe(0) -->PTe(0). Now, when the CPU accesses to the address 0xFFFF8000'00000000, the path will be this: - PML4e(0x100) --> PDPTe(0) --> PDe(0) -->PTe(0). Knowing that the PML4 entry 0x100 is self-referential, when the CPU accesses to the previous address, it will repeat the first level (PML4) and then, it will take the branch of the paging tables that map the virtual address 0. 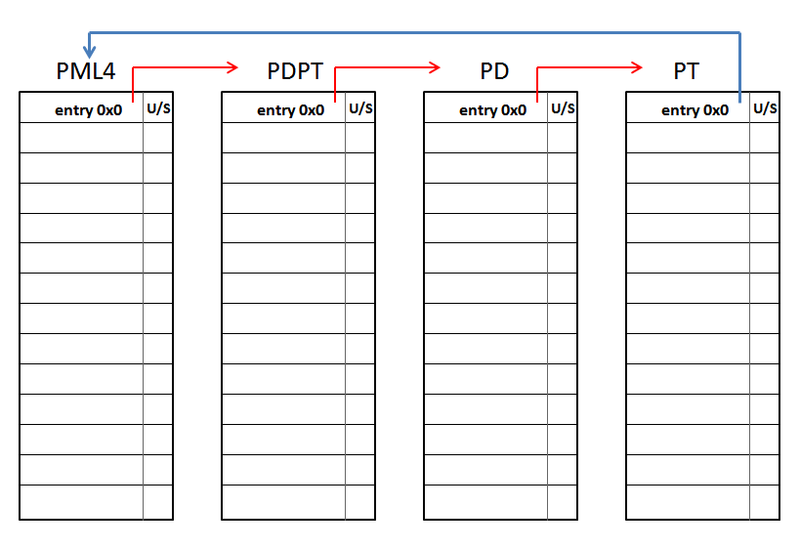 The trick here is that the paging tables used are shifted, and that the real path to follow is this : - PML4e(0x100) --> PDPTe(PML4e(0)) --> PDe(PDPTe(0)) --> PTe(PDe(0)). If we look at the lowest level, the PT entry associated with the address 0xFFFF8000'00000000 is the PHYSICAL address pointed by the PAGE DIRECTORY entry number 0 used to map the memory range 0~2MB. Which means that, when the CPU reads the address 0xFFFF8000'00000000, it will read all the PAGE TABLE entries used to map this memory range. Let's see another example by using the address 0xFFFF807F'FFFFF000. This address points to the last 4KB of the 512GB assigned for PAGING MANAGMENT. The path to be followed by the CPU is this: - PML4e(0x100) --> PDPTe(0x1FF) --> PDe(0x1FF) --> PTe(0x1FF). 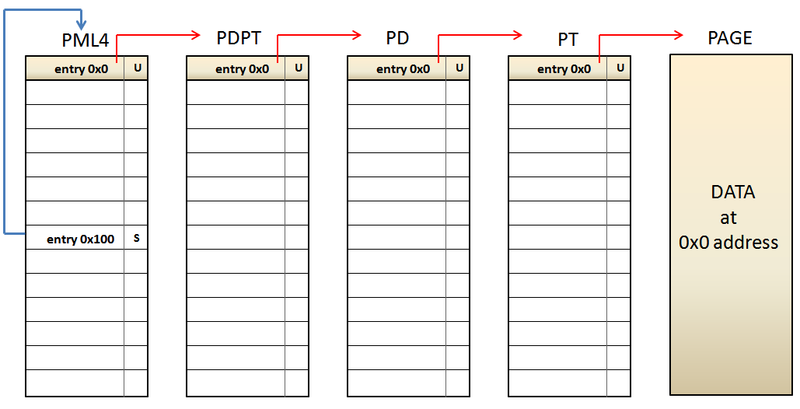 Which it is the same to: - PML4e(0x100) --> PDPTe(PML4e(0x1FF)) --> PDe(PDPTe(0x1FF)) --> PTe(PDe(0x1FF)). As a result, the CPU will have access to the PAGE TABLE used to map the highest 4MB of the virtual address memory range addressable by 64-bit Intel processors, located at 0xFFFFFFFF'FFC00000~0xFFFFFFFF'FFFFFFFF. Thus, the CPU, and obviously the operating system, are able to access to any paging level, what is absolutely necessary for manage them. Depending on which address it's chosen within the memory range 0xFFFF8000'00000000~0xFFFF807F'FFFFFFFF, the operating system is able to access to any paging table used to map virtual memory in the valid 48 bits of the virtual memory range allowed by Intel's x64 CPUs. Is short, this mechanism makes a DOBLE USE of paging tables, because on one hand these are usually used to map virtual memory, and at the same time are re-used by shifting one or more paging levels, when the CPU accesses them through a self-ref entry. This technique is really eficient because it only uses 8 bytes (one entry) to be able to manage ALL paging tables declared by the operation system. While this technique is highly efficient, nothing is perfect. There is an implicit "problem" in the use of self-ref entries related to the absolute lack of randomization. We could give a formal definition like this: "Given a self-ref entry, it's possible to calculate the virtual address of any paging table mapped by the operating system". Let's see an example using the self-ref entry number 0x100. This entry maps the memory range: 512GB * 0x100 ~ 512GB * 0x101 Using real numbers, the virtual memory range is: - 0xFFFF0000'00000000 + 0x8000000000 ( 512GB ) * 0x100 ~ 0xFFFF0000'00000000 + 0x8000000000 ( 512GB ) * 0x101 What is the same to 0xFFFF8000'00000000~0xFFFF8080'00000000, which it's used for Paging Managment. 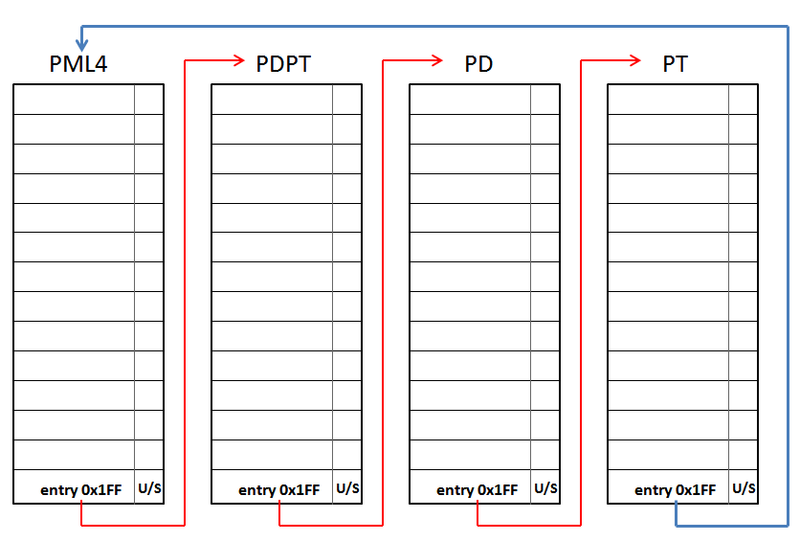 Now, we want to get the PAGE TABLE that maps the virtual memory range 0~2MB: - PML4e(0x100) --> PDPTe(PML4e(0)) --> PDe(PDPTe(0)) --> PTe(PDe(0)). What it's the same to: - 0xFFFF0000'00000000 + 512GB * 0x100 (self -ref entry) + (1GB * 2MB * 4KB ) * 0x0 = 0xFFFF8000'00000000 So, it means that the PAGE TABLE sought is located at the virtual address 0xFFFF8000'00000000. --------------------- Now let's try the self-ref entry number 0x101 . This entry maps the memory range: 512GB ~ 512GB * * 0x101 0x102 Using real numbers, the virtual memory range is: - 0xFFFF0000'00000000 + 0x8000000000 ( 512GB ) * 0x101 ~ 0xFFFF0000'00000000 + 0x8000000000 ( 512GB ) * 0x102 What is the same to 0xFFFF8080'00000000 ~ 0xFFFF8100'00000000, which it's used for Paging Managment. 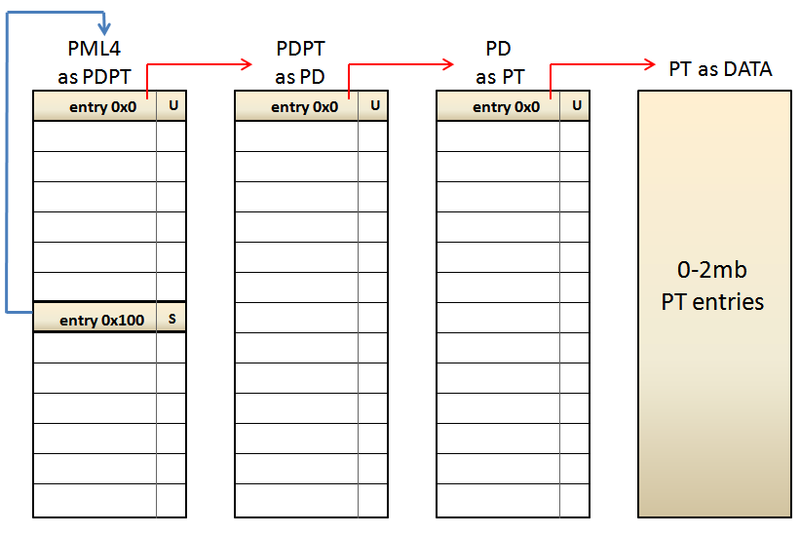 Now, we want to get again the PAGE TABLE that maps the virtual memory range 0~2MB: - PML4e(0x101) --> PDPTe(PML4e(0)) --> PDe(PDPTe(0)) --> PTe(PDe(0)). What it's the same to: - 0xFFFF0000'00000000 + 512GB * 0x101 (self -ref entry) + (1GB * 2MB * 4KB ) * 0x0 = 0xFFFF8080'00000000 So, it means that this PAGE TABLE is located at the virtual address 0xFFFF8080'00000000. --------------------- If we compare the PAGE TABLE addresses obtained previously, we get a difference of 0x80'00000000, which is the same to 512GB. It means that, the difference between the PML4 entry 0x100 and the PML4 entry 0x101 is 512GB. So, if an operating system uses a different self-ref entry, it's possible to calculate exactly where the PAGE TABLE that maps the memory range 0~2MB is. This is true for any of the 512 entries availables in the PML4, which these can be abused by an attacker that knows the number of the self-ref entry used by the operating system. So, the only way to implement KASLR (Kernel randomization) for paging tables is by randomizing the position of the PML4 self-ref entry. Thus, an attacker is not able to calculate exactly where the paging tables are, although it could in theory, because the PML4 has only 512 entries which, in general, only the 256 highest entries are intended for KERNEL SPACE. Yes well 1/256 possibilities is not a big number to protect a system, but this is still better than 1/1 ;-) In short, there is no way of paging tables randomization when the position of the self-ref entry is fixed.